It’s hard to believe a whole year has passed, but Merlot Month has rolled around again. How time flies! We, however, did not wait for October to celebrate. I can happily say that we’ve had several Merlot-driven celebration. 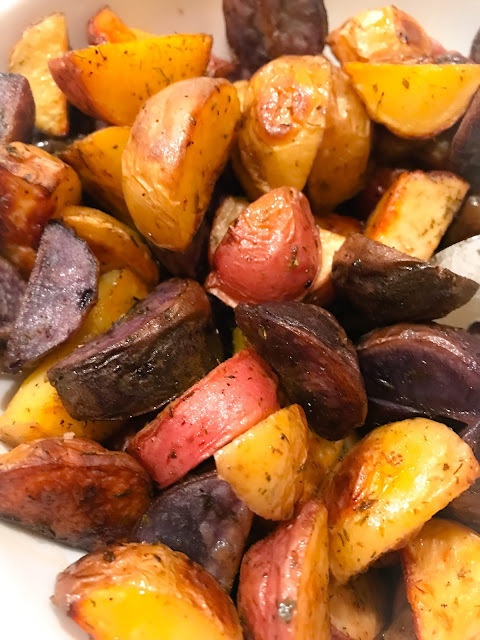 I will have a new Merlot-themed “Cooking to the Wine” very soon, but I thought I first share some of the lovely dinners we’ve had centered around this velvety grape that really show a range of styles, even though these are all from California. The Pellegrini family traces their history in the Sonoma wine business back to the early 20th century, but they purchased a 70-acre apple and plum orchard on in Santa Rosa in 1973 and then converted it to a vineyard in 1975. The winery continues to be under family control and Alexia Pellegrini took over for her father, Robert, in 2017. As far as red varieties go, they focus more on Pinot Noir–they have on of the oldest existing Pinot vineyards in the Russian River Valley. 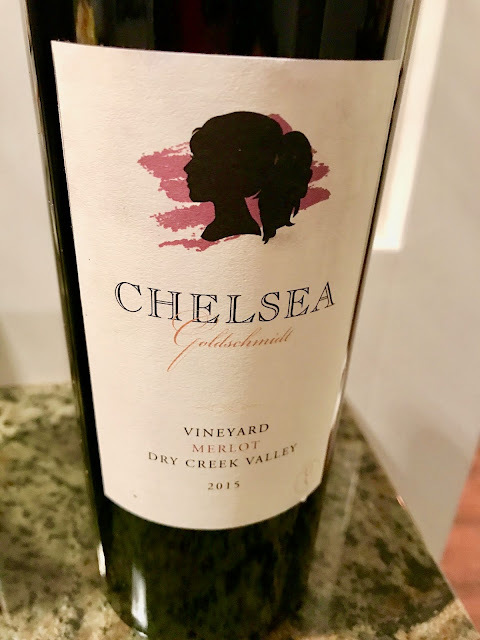 Nonetheless, we really enjoyed this herb-y take on a California Merlot. We had some thick slices of leftover roast pork and deliciously sweet summer corn. 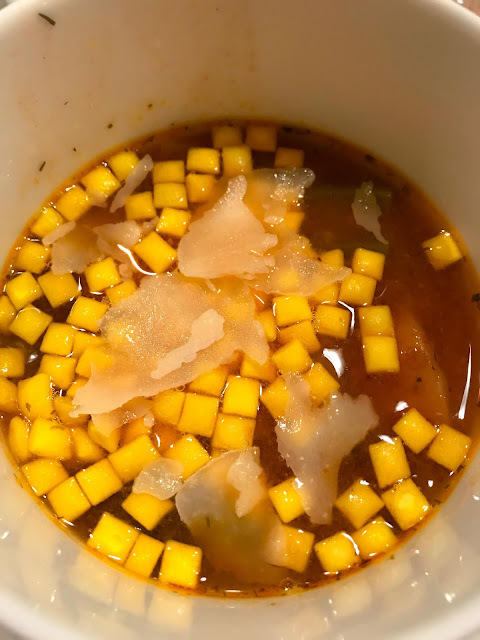 I’d planned to make our favorite creamy corn with jalapeño, bacon, and cheddar, but when we tasted the wine we changed our tactic just a bit. The wine had lots of big, rich fruit note to be sure. Lots of spiced plums, black cherries, blackberries, and raspberries galore. I’d expected to find baking spices and chocolate on the palate, which were definitely present, but then more savory herbal flavors and cedar mixed things up and added interest. That savory shift led our food seasoning in a different direction. Instead of jalapeño-bacon-cheddar corn I decided to make a quick bechamel (I kept it on the thinner side) and flavored it with puréed fennel fronds, then added in the corn, along with halved cherry tomatoes. I gave our pork chops a quick sear to reheat and dinner was good to go. The wine matched beautifully with this herbal twist on the corn! 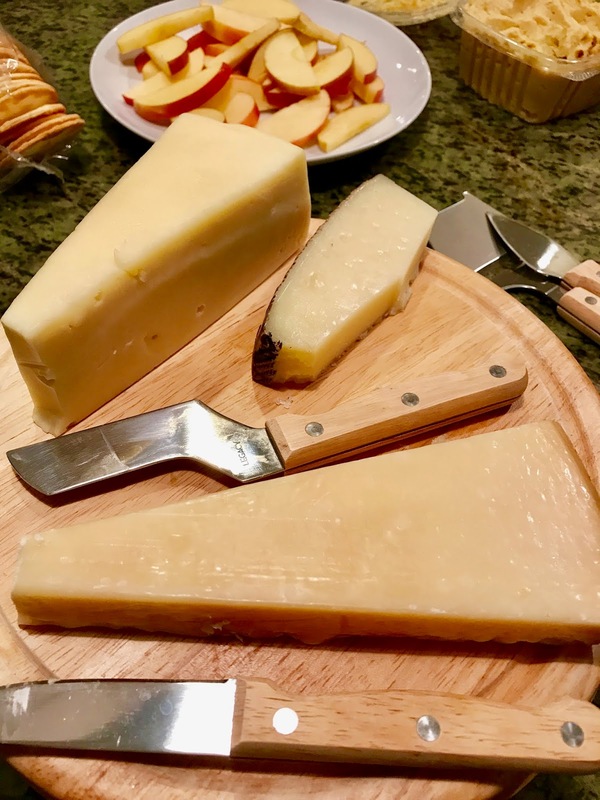 This wine could also certainly handle heavier meat dishes as well, but all told, the pairing really brought out the best in both the wine and the food. Earlier in the year we had our friends John and Kathryn over to dinner for Merlot-centered dinner. We each had a Baller Merlot in our respective stashes with a bit of age, so we decided to get together to open them up. Both of these wines came from mountain vineyards, which will tend to show deeper, more concentrated fruit with a lot of structure. 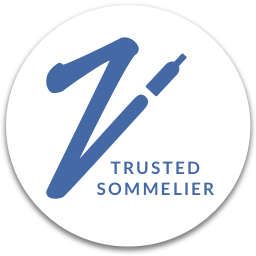 I find that certain mountaintop Merlots could easily be mistaken for Cabernet Sauvignon as they will show more robust tannins, but usually with fewer green notes coming from pyrazines. Pride and Paloma are both family-run vineyards, both in their second generation within the family. 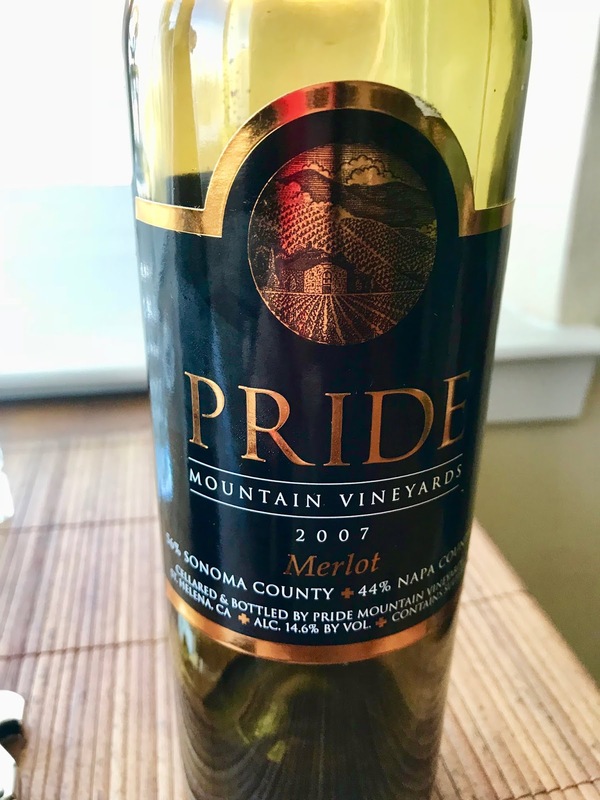 The Pride Merlot comes from a blend of Napa and Sonoma mountain vineyard blocks, hence the California designation. They blended in 6% Cabernet Sauvignon for a polished structure. Both of these wines were showing beautifully for their age! They also both had that big bold structure. In both cases the tannins were robust but smooth, supple, and ripe. The Pride has layers of dark spiced fruit and a long, silky finish. Lots of black fruits here. 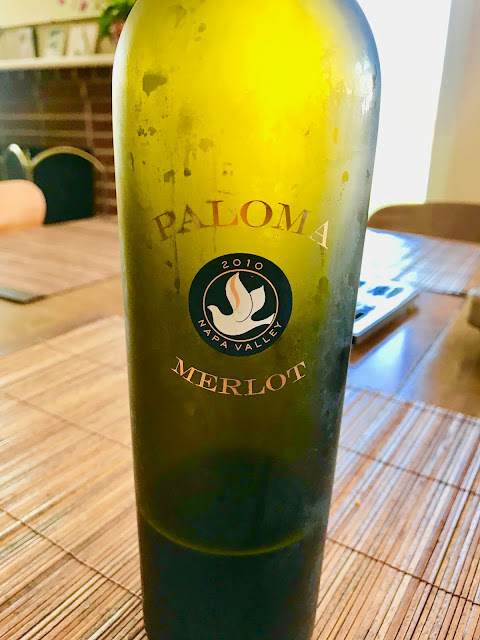 The Paloma also had lush fruit notes, a touch more in the red camp than the Pride, and showed more herb and olive tones. We were a happy bunch drinking these two wines. The glass on the Paloma isn't frosted. I had put the leftover wine in the fridge to help preserve it to the next day, hence the frosting and condensation. Sadly, I could not find much specifically on the 2010 Paloma Merlot, but the Paloma Vineyard is located on Spring Mountain at elevations of Paloma Vineyard of 2060 to 2240 feet above sea level. The soils are derived from the Sonoma volcanics and Franciscan sandstone. 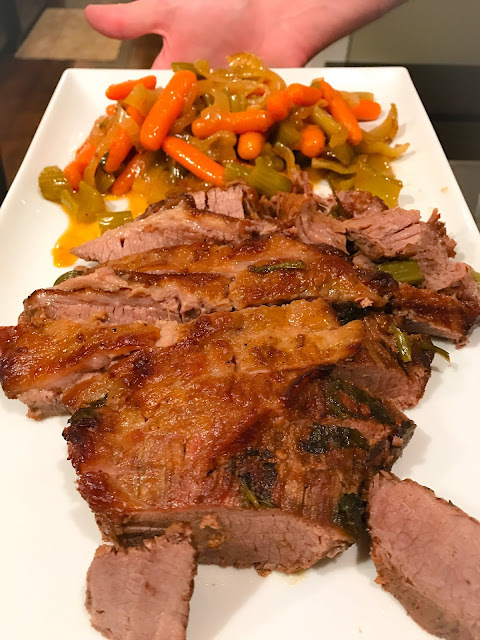 We also happened to pork for this dinner, along with roasted multi-colored cauliflower and smashed potatoes with leeks. I don’t mean to aggressively push the pork-Merlot combo! These two dinner were months apart. Nonetheless, I do think it’s a combo that tends to work well. We started off with some cheese to much on and both the wines went generally with the spread. We then moved on to a lovely vegetable soup. Ari shared the recipe for this with me and it will follow right after. The Chelsea Goldschmidt Merlot Dry Creek Valley 2015 paired well with this soup as it was the lighter in body of the two wines. It had ripe, juicy raspberries and cherries with a few darker berries mixed in. It was also a solid value option at around $20. 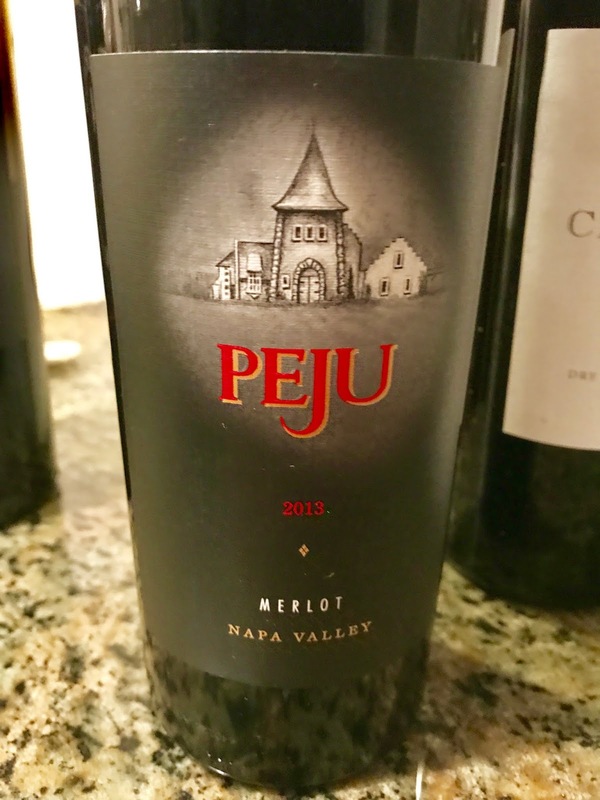 The Peju Merlot Napa Valley 2013 was a little more robust with darker fruits with herbs and cigar box notes. 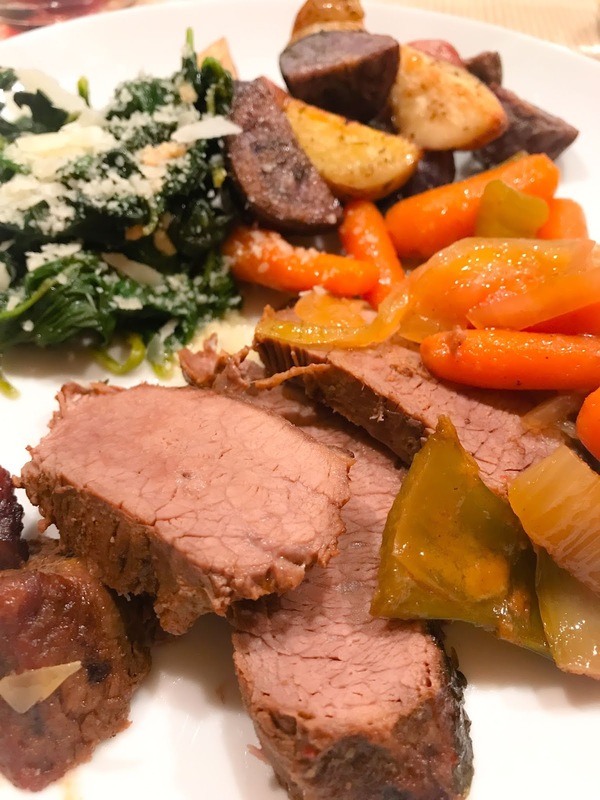 It made a great match for the brisket with vegetables and roasted potatoes. Keeping in line with the rest of our wines today, both of these wines are also from family-owned wineries. Add the diced tomatoes and the chickpeas with the juice from the can. Add the carrots and celery. Season with salt, pepper and whatever else you like. I use Dill, white pepper, some sort of smokey spice something like cayenne, and garlic powder (real fresh garlic works too). - Then comes what YOU choose to put in. I use one quarter head of cabbage diced, mushrooms, potatoes, turnips, parsnips, sweet potato using a peeler so it dissolve into the soup. Then I usually find one or two seasonably relevant other veggies and add them as well (i.e. squash). Part of the fun is starting at the vegetable section at the farmers market and picking what looks fun. Add a second layer of seasoning after all these are in. Fill the the top of the vegetables with chicken stock. bring to boil. Simmer for two hours (longer if you have time). - That's the vegetarian version. You could always throw a few chicken legs/thighs in as well. Make sure the chicken itself simmers for at least two and a half hours. Short rib could also be a great addition. Use your imagination. I’m happy to see this variety making a comeback in a big way. Duckhorn’s Three Palms Vineyard was #1 in Wine Spectator’s top 100 last year. Read more about pairings for that wine here and here. Sarah at Curious Cuisiniere shares “Peking Duck and a Merlot Wine Pairing"
Julian at BC Wine Trends shares “BC Merlot with Ribs for Thanksgiving"
I love that you've enjoyed some Merlot with some age on it Nicole. Also love that "game-time" decision on the first food and wine pairing. Cheers! The aged versions were showing beautifully! No reason not to lay some of these down for a short while. Those are some amazing food and wine pairings. Thanks for sharing. They were super tasty! Thanks Wendy! Looks like you had some nice Merlot & food celebrations for #MerlotMe! Cheers! We did indeed! Thanks Jane! fantastic pairings. I did notice that ll the photos are of empty or almost empty bottles- that's a good sign! Definitely don't want to leave any drops behind!